On Tuesday, June 16, Dogfish Head Alehouse will donate 15% of all sales (food, beverages, merchandise, gift cards, etc.) to Gaithersburg HELP. Offer good for both Dine In and Take Out orders. Funds raised on that day will directly support all of HELP’s programs, including the pantry, infant needs, prescriptions and transportation. Share the promotional flyer with family, friends and co-workers. 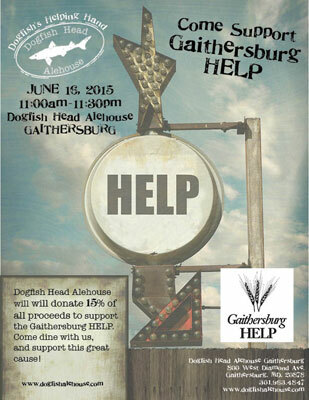 There is no need to bring the flyer with you and you don’t need to mention Gaithersburg HELP to your server – everyone who dines at Dogfish Head Alehouse(Gaithersburg) any time on Tuesday, June 16th, will be supporting us! Stay tuned for updates, as we hope to incorporate some on-site raffles/silent auctions with exciting prizes for those who join us throughout the day. Mark your calendars and join us on Tuesday, June 16th!